The questions over the probable rise in rates in the US combined with political uncertainty faced by the Eurozone has been weighing on fixed income markets. This context combined with low rates across developed markets has created a challenging environment for the bond asset class. Charles Zerah, the Fund manager of Carmignac Portfolio Global Bond will outline how his flexible and opportunistic philosophy allows him to navigate the challenges in place. 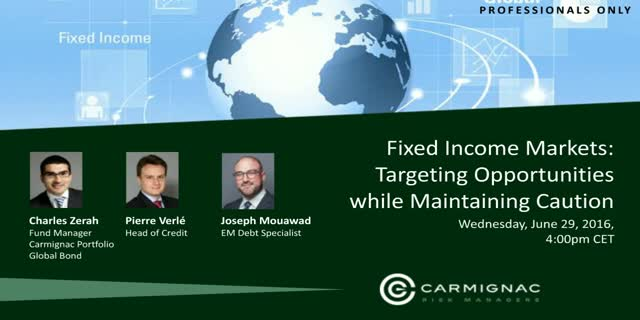 He will be joined by Pierre Verlé (Head of Credit) and Joseph Mouawad (EM Debt specialist) who will detail the opportunistic investments in cheap, performance generating strategies, while Charles explains how he combines this with a cautious stance to maintain a balanced portfolio.